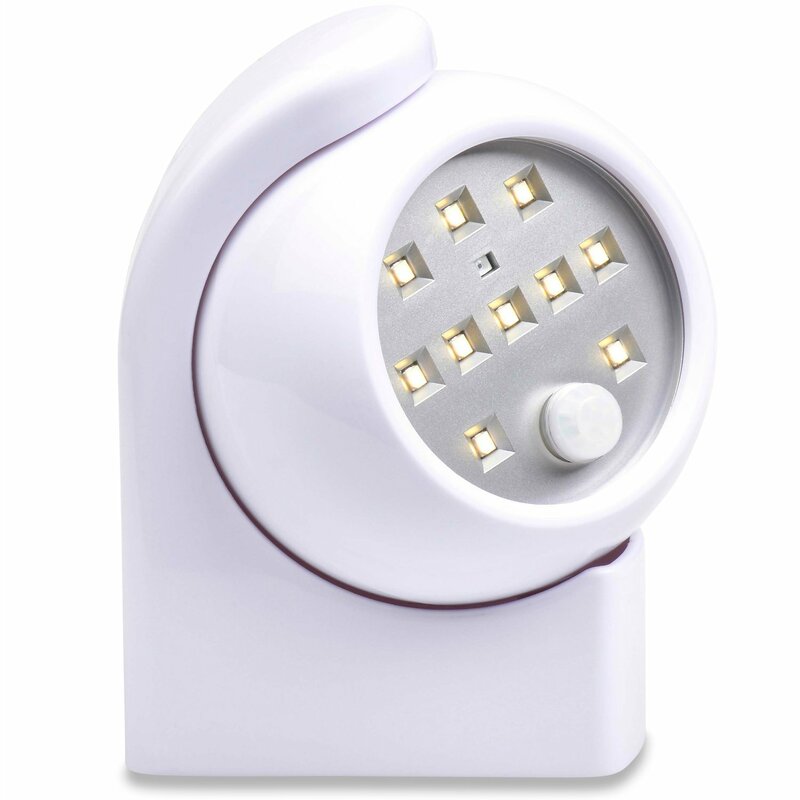 Home › Energy-Efficient LED Lighting › Motion Sensor Night Light For Hallway Stairs Closet Bedroom Kitchen & More - ..
Motion Sensor Night Light For Hallway Stairs Closet Bedroom Kitchen & More - .. Batteries: 3 AA batteries required. Fixture Features: No electricity or wiring required!, Includes mounting bracket, Includes mounting hardware (super strong 3M adhesive pad + mounting screw), Requires 3xAA batteries (not included), Durable plastic splashproof body. INSTANTLY IMPROVE YOUR SAFETY WITH BRIGHT LIGHTING - Wouldn't it be nice to have bright light illuminating those dark areas in and around your home? 10 Bright LEDs give 60 Lumens of warm white light, so you never have to stumble in the dark or turn on overhead lights and disturb sleeping people. CONVENIENT, HANDS-FREE LIGHT RIGHT WHERE YOU NEED IT - High quality built-in motion and light sensor activates in the dark and automatically shuts off after 30 seconds, prolonging battery life. Convenient 360 rotating swivel head allows you to angle the light anywhere: no other motion sensor light on the market has this! HASSLE-FREE, STICK-ANYWHERE INSTALLATION - No electricity or wiring required! Just peel and stick to any surface with 3M adhesive pad or use mounting screw (both are included). No bulb replacement needed with energy efficient LEDs. SLEEK & STYLISH - Latest, updated design will look great anywhere in your home. Buy one for every dark corner. Perfect gift for family/friends to make their life safer and easier! Order 3 and get FREE shipping!